Getting ready to chomp down on your first juicy burger of the barbecue season? Well, right now you know where that meat came from, but in a few years, that might not be the case. Yes, the scientific community, and it is a community — not just one rogue scientist hiding away in Norway or Sweden somewhere, is developing test tube meat. Technically, it’s more of a Petri dish meat, but the concept is the same. This is how it works: Cells are grown into muscle tissue which eventually becomes edible meat. For lab meat to be feasible, the muscle tissue has to be stimulated to grow much like human muscles need to be stimulated or exercised in order to grow. While scientists have so far grown a piece of meat the size of a contact lens, they realize that this is not going to feed the world. They are investigating a variety of cost-effective methods that will grow muscle tissue that will lead to steak and burgers that most of us will be proud to eat. I know that your first reaction is “Yuck!” When we bite into that cheeseburger or hot dog we want to know that at one time it went “Moo” or whatever sound a hot dog makes before it becomes a hot dog. We want to know for some warped reason that our food was alive and kicking. Scientists do say that the Petri dish meat offers many advantages to real-animal meat. First, it will eliminate or at least greatly reduce the need for slaughterhouses, and that’s a nice thing. I admit that I am an omnivore hypocrite. I like a good burger once in awhile but I don’t want to know what happened to that meat before it wound up on my plate. I like the fact that by the time I get the burger, it is all nicely cooked and sitting on a bun with no sign of a head or a hoof. This is why I can’t go to pig roasts. I don’t want to see an entire pig sitting in front of me waiting to be carved. 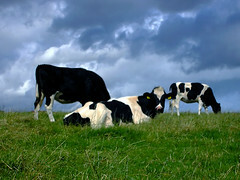 Scientists also argue that lab meat will help to reduce gas emissions. At first I thought they were talking about gas emitted from animals but it turns out they are talking about the gas-house emissions that result from the resources needed to sustain the agricultural industry. And reducing emissions would be a good thing too, but I still have questions about this process. What happens to all the animals? Are they all unemployed then? Are they put on strict birth control regimens so they only produce one calf or pig or chick because there is no reason for them to really reproduce? If they are not going to be fast food meals for us, are they not going to exist? Will the expense to keep them on farms outweigh their usefulness? My next concern is this: As the generations go on and view lab meat as their primary food source, will our descendents not realize that meat came from animals? And what about the deer that are out there? Don’t you think they are going to feel slighted? Sure, the cows and pigs get out of being slaughtered, but the deer run free. Hunters are not going to want to go into a lab and shoot a Petri dish? Somehow, I think that might take the thrill of the hunt away. Lastly, what about the farmers and ranchers? What happens to them? Does Mr. Perdue go out of business? What about the cattle ranchers out west? Do they convert their ranches and chicken farms to labs? Will they make the lab meat? I will admit that the Petri Dish lab meat has promise, but there are a lot of issues that need to worked out before I toss one of these puppies – and I don’t mean that literally – on the grill. Ole MacDonald had a test-tube, e-i-e-i-o! 😉 I’m thinking, um, yuck! I don’t know Jack. They say that you would never be able to taste a difference. I think they should use you and Eric as taste testers. You both love your meat! A lab hot dog? Well, when you think about it, it has to be better for you than the real thing. Right? I think the only reason that cows haven’t gone extinct is because they are delicious. Well, they are cute too! Aren’t they in a homely sort of way. I think so. I would keep them around for looks only. I guess if they can make test tube babies, then test tube burgers is certainly “conceivable”. HA HA Matty, great play on that word! Yes, I do see the advantages of lab meat, but I have to admit that it creeps me out a bit. I wonder if this invention will help me with my problem? I’ve been spending 1,000’s of dollars on products every year to try and make my meat larger and I’ve yet to find a product that actually works. This might be just the ticket for me! Um, I heard it requires electrical shocks. Is this something you really want to undertake? I would think twice Mayor!